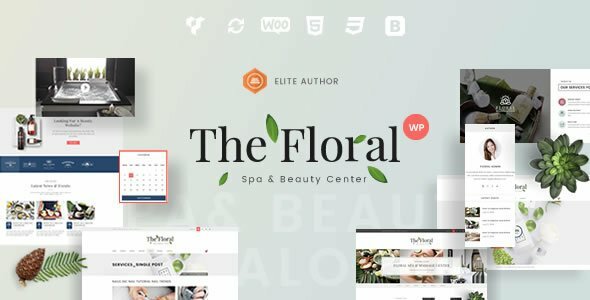 FLORAL is perfectly responsive beautiful spa and beauty WordPress theme for beauty salons, wellness centers, SPA, massage and other health and beauty related websites. FLORAL will certainly take your business to the next level with its elegant design combined with the latest techniques in website design. Specializing in spa and beauty WordPress theme, it offers a gorgeous theme design, in addition to some niche-specific features and options. The layout is responsive and very flexible. Not only is FLORAL – Spa and Beauty WordPress Theme perfect for showcasing your spa or salon business, but it also allows you to sell products and services on the web. With its WooCommerce plugin integration, you can easily list items or packages for sale, accept payments, and have an online store up and running with just few clicks. Whether you are selling cosmetic products or merely want to persuade your clients to book their appointments online, FLORAL theme can help you do it with ease. Nowadays, when most business owners turn to the Internet to sell their products and services, having a powerful, yet simple to use online store is absolutely vital if you take your business seriously. This is why Floral – Spa & Beauty Responsive WordPress Theme comes with WooCommerce, the most popular eCommerce plugin that makes managing your online store and handling shipping, payments and even taxes easier than ever. We also included WooCommerce Currency Switcher, a WooCommerce plugin that allows you to switch to different currencies and get their rates converted in the real time. Floral – Spa & Beauty Responsive WordPress Theme is the ultimate web tool that allows you to truly express yourself and set up a website that conveys the brand of your business. We also included Visual Composer – an intuitive plugin that helps you set up any layout you can imagine. And the best part: even absolute beginners will love using it, as it allows you to create even the most complex layouts without having to write a single line of code. Revolution Slider – create a responsive(mobile friendly) or fullwidth slider with must-see-effects and meanwhile keep or build your SEO optimization (all content always readable for search engines). See the heaps of custom transitions/animations for each object on the page! Customize this slider with convenient drag&drop backend to your very needs. This plugin features tons of transition effects, an image preloader, video embedding, autoplay that stops on user interaction and lots of easy to set options to create your own effects. It’s one thing to develop a responsive theme, but it’s something else entirely to develop a theme that leaves your visitors breathless, regardless of the device they’re using to access the internet. Floral is a fully responsive theme that seamlessly adapts to any screen size and unleashes the full potential of each pixel thanks to Bootstrap 3 – a powerful framework that guarantees an impressive performance. Even the smallest elements have been tweaked to perfection, turning your website into a crisp, detailed visual experience to behold. Built on Twitter Bootstrap – Floral uses Twitter Bootstrap. This means that a range of shortcodes are automatically supported. For ease of use you can use the Visual Composer, Easy Bootstrap Shortcode or any other plugins to easily add visuals to your website.